Marz wanted to start a quilt with Pari. 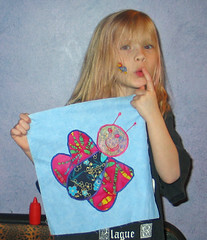 So Pari drew a butterfly, Marz used it to make a template, and together they made the first of 20 quilt squares. Only 19 more to go.